Outputs the liquid level continuously by measuring the liquid pressure near the bottom of the tank. Simple zero and span adjustment by pressing one touch pushbuttons. Compact design with the amplifier integrated into the case makes for easy installation. It has both delay setting and abnormality notification function. The liquid contact parts are made of highly corrosion-resistant SUS316L. Therefore, the meter is very durable and corrosion resistant. This meter achieves higher precision than ordinary models; 30kPa (at a water depth of 3m), and a linearity of +-0.5%. It is easy to make the initial adjustments and span adjustment, using pushbuttons. You can adjust the response speed using the delay setting function. Since these units can handle a wide range of power supply specifications (20 to 250 VAC/DC), they can be used in any location in the world. 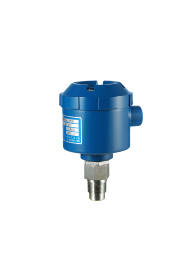 * The video demonstrates actual measurement using this sensor. When the meter cannot be install on the top of a tank. R 3/4 (a screw-in type and flange type are also available). *1: ‘Calculated as a water level’ means measuring a liquid with a specific gravity of 1. *2: Accuracy at 25ｰC and above.